Glass, human tissue (donated by anonymous donor), fibroblast cells (HaCaT cell line) agar, resin, flock. Glass, Human tissue (Cells and tissue, cultured from tissue taken via biopsy) polyeurathane, acrylic, flock. Created from Residency at SymbioticA, the Art and Science Collaborative Research Laboratory with support from The Australia Council for the Arts. In obtaining parts of peoples’ bodies and culturing them, this work sought to question and challenge the boundaries of body ownership. Considering that we are not legally able to own our own bodies or the bodies of others, I was interested to see if it was possible to own the fragment of the body that I had scientifically manipulated; be it my own body or someone else’s. Do I have the right to manipulate it, kill it, or financially gain from it? (All of these things I am able to do). How much of a person’s body would I have to grow for it to be considered their body rather than a waste material? The resulting work Slip me Some Skin, involved excess cosmetic surgical tissue taken from an anonymous donor. In doing so it involved a further exploration of the body, and it’s components as commodity. Because unlike working with my own body, the work engaged with tissue from a less personal perspective, it was an engagement with an unknown other, in a similar way that recipients of organ donation are faced with abject tissue from an anonymous body. It also draws from attitudes towards flesh in primitive history, and later Christianity, as well as attitudes towards tissue reliquaries. The tissue specimen in this work was a piece of skin removed from the breast of a female donor. On August the 3rd at 6:00pm I collected the specimen from the hospital and took to the UWA SymbioticA Lab to harvest. Surprisingly, harvesting and culturing this tissue involved a much more heightened and subjective experience than working with my own body. The sheer quantity of tissue, its still warm temperature and its origins in another body contributed to an intense experience, which alienated me enough from it to firmly re-embody me within myself. Throughout the process of harvesting the tissue, which took approximately five hours, the repetitious actions of mincing down the tissue (with scissors) and centrifuging began to make me question if I was a part of the conveyer belt of the tissue economy itself, mindlessly processing human tissue for absurd means. I felt the tissue should be with the anonymous donor, whose motives to be involved in the project I would never know. I began to obsess about her identity, and immediately felt I understood, on a basic level, a kind of psychological distress that organ recipients may feel. I imagined the incorporation of this tissue into my own body would have a strong impact on my sense of self. I harvested enough tissue to grow an abundant amount of cells from. The remaining tissue I used as armatures for the harvested cells. Through coating the tissue in a layer of fibroblasts - sealing the outer tissue with inner scar tissue. In this way, sealing the skin tissue with fibroblast tissue, and the anointing of my body with my skin cells (in HE BEING DEAD YET SPEAKETH) are both acts of inscribing the scientific body onto the literal, physical (social) body, through their layering of the internal body onto the external one. Two tissue forms were created from the donated tissue specimen – vampire fangs and a crucifix. In adopting popular iconography of vampire fangs I sought a playful form with which to engage ideas of the use and ‘consumption’ of human tissue through biotech and biomedical practices. Alternatively, the crucifix engages ideas of ritual and sacrifice, a reading reinforced by the presentation of the tissue in glass vessels, reminiscent of ritual sacrifice vases and amulets. 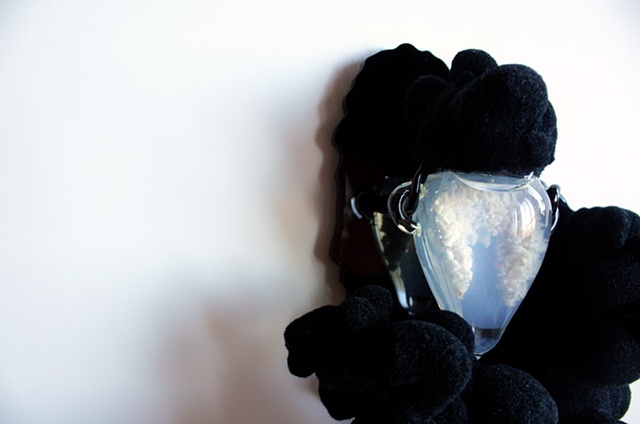 Tissue reliquaries appear of each side of the space, revered as relics within a church or sacred space. The reliquaries frame a video projection of animated footage taken throughout the laboratory process. In the footage, the tissue pieces are suspended in transparent agar, in a petri dish which is held upright, between my fingers. They forms appear to have a life of their own, as they rotate, flickering, between my fingers, morphosing between fangs and crucifix as if possessed. The presentation of these once-living preserved forms also illustrates the actual limitations of our technological expertise over life. Though the work involves processes of growth, the cells inevitably end in death; a transition of the body from a living subjective entity to a thing for the taking/growing/breeding for biomedical capital, or in this case, artistic form.